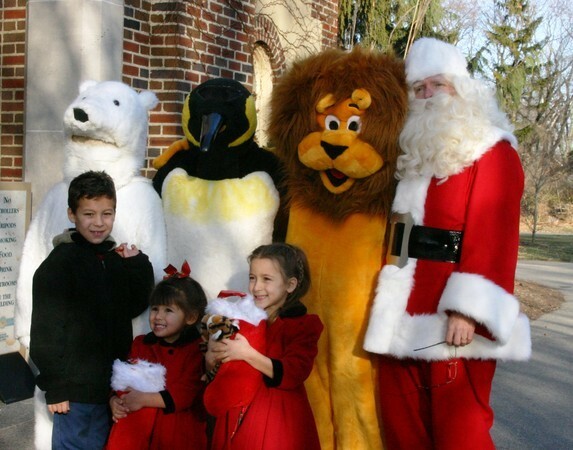 Jolly ol’ St. Nick is slated to take a few breaks from his busy holiday schedule to host a special series of breakfast buffets at the Detroit Zoo. Breakfast with Santa will be held in the Zoo’s Wildlife Interpretive Gallery on three consecutive Saturdays starting this weekend Dec. 3, and continuing on both Dec. 10 and Dec. 17, 2011, 8 a.m. to 10 a.m.
Santa Claus will mingle with guests, and every good little girl and boy will receive a special holiday gift. The family event will also feature costumed characters, arts and crafts and holiday movies in the Wildlife Interpretive Gallery Theater. Photos with Santa will be available at an additional cost. The cost, which includes Zoo admission and parking, is $30 for adults (ages 15 and older) and $25 for children (ages 14 and younger). Admission for those who are Detroit Zoological Society members is $25 for adults and $20 for children. Tickets must be purchased for all children regardless of age as seating is limited. Advance reservations are necessary by calling (248) 541-5717 (press 3). Situated on 125 acres of naturalistic exhibits, the Detroit Zoo is located at the intersection of 10 Mile Rd. and Woodward, just off I-696, in Royal Oak. This entry was posted in Detroit, Things To Do and tagged christmas, detroit, detroit zoo, holidays, santa claus. Bookmark the permalink.